Thom Bresh just took delivery of a new Bigsby guitar that is very similar to Merle's 1948 solid body. You can see a nice picture of it on his "Facebook" page, I think it is spelled "Giletta-Bigsby" or very close to that. I agree it's disingenuous (five dollar word... means 'sneaky') to produce "Bigsby" guitars now that PA is gone and he quit making them himself. I cringe at the "new" D'Angelicos. They're made by the same factory that makes Gretsch so the quality is good as far as it goes but John carved his tops and necks with an apprentice to help him so they just ain't the same. I looked at the guitar being talked about and I think it is an honest effort to replicate PA's guitar (Birdseye maple etc )and as such might get a pass although I can't read the headstock. I don't know if it reads "Bigsby" or not. I think it may not actually say "Bigsby". There's a guy (whose name escapes me) that is making great looking copies of the Maphis Mos-Rite double neck. Looks good to me. Doesn't say "Mos-Rite" but it looks like the guy was as faithful to Semie's ideal as he could be. And remember, Martin is making a limited run of a replication of the Martin/Bigsby Merle had. I don't kmow if they use the Bigsby name. I suppose they could if they paid Gretsch (who owns the name now, I think) a royalty on the things. The Galletta-Bigsby guitars actually say "Bigsby" on the head stock. Bresh says his has an original style pickup in it, so I belive him. As far as the D'Angelico guitars go, I have one of the newer Excel guitars, best sounding guitar I've ever owned, including my 64 country gent. the workmanship is spectacular, the price is reasonable,and it is made in Asia. There are several companies, that are making either acoustic bodies with Bigsby necks for sale, I believe either martin or gibson comes to mind. Harvey Leach makes a D-28 replica with a Bigsby neck, two models, one real fancy and one more plane, just like Merle's acoustic. These are fully custom and are about $5,000, by order only. Anyway, all it takes in money. Is this one more or less like the one in question? It's a dead-on rplica of the early solid body PA made for Travis. and you'll find it. The on site photo is small but you can lee it looks good and is leaning against a nice Standell. The bottom lin on all these replicas like this or mass produced D'Angelicos that once were hand made one at a time may turn out fine guitars but they lack the special touch and indescribable "mojo" the orighal makers gave to their instruments. 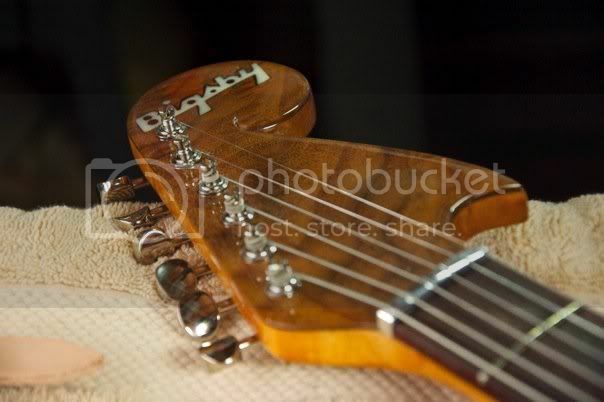 Here's a photo of the solidbody Bigsby headstock in question: I found several photos at this link: http://s25.photobucket.com/albums/c100/mdm2k2/breshman/?sort=ascending. I think reissues are great as long as they are identified as such. The Martin has Bigsby on the front of the headstock and Martin stamped on the back of it. I love the Gretsch reissues. I don't think it lessens the value of the originals, if anything I think it draws more attention and interest to the history of the originals. "... I don't think it lessens the value of the originals..."
There are some great reissues out there. Some (as I think most would agrree) like Gretsch have never been better. Prior to them being made by Terada there were some real horror stories about some of the units made at the Brooklyn factory some of which I saw myself when I worked in a music store. The worse one was opening a brand new Tennesseean in front of a customer only to see the neck had popped out of its joint. Another one had a white paint dribble on a Tenny's f-hole outline. I'd say the current Treada Gretsch guitars are an improvement but you still see the "vintage" ones going for hellacious prices. But, as I say, there are great looking and playing reissues out there but, to me, the handmades like Paul Bigsby's and John D'Angelicos in particular, are things that had their time and can't be truly replicated. The guy making the Travis/Bigsby clones looks like he's doing a good job trying to make a full on copy and he may have taken it as far as the pickups, too, I don't know. Bigsby was popular during his day because a solid guitar was an absolutely brand new idea but he was glad to quit making them because I don't think he felt he was getting what he thought he should ahve for his time. I think he managed one a month. Leo Fender made more cheaper. The Martin/Bigsby is fair since it does what the original one did which is to add a non-standard neck to a Martin guitar. There was a good testimonial for a modern D'Angelico but those, I think, don't have carved tops which make all the difference in the world. That's part of the fun of playing guitar, y'know... splitting hair on inconsequential things. From "The Story of Paul Bigsby - Father of the modern electric solidbody Guitar" by Andy Babikuk 2008: "The best estimate today puts the total of Bigsby instruments at 23 Standard electric guitars, 15 re-necked and customized acoustic guitars, 6 mandolins, about 75 steel guitars, and a number of mandolins and guitars to which he added pickups and/or pickguards." scroll down in the link, here is the "all bigsby band" at the 5th annual guitar geek festival in Anaheim ca, I believe it was in 2008.